Our Criminal Justice system is both frightening and confusing. It's not a system that you ever want to face unprepared. 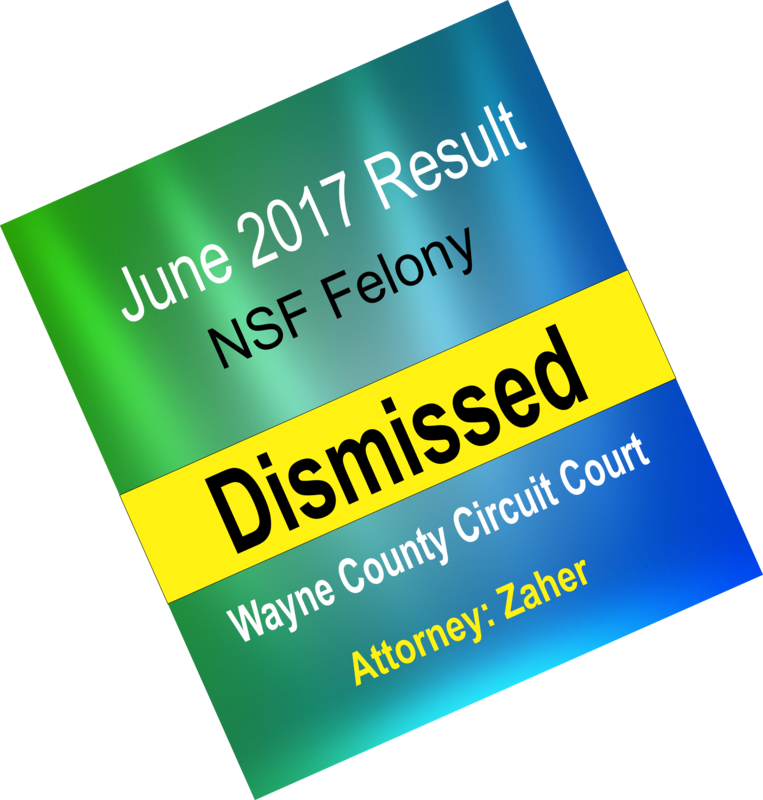 A criminal conviction in the state of Michigan will drastically affect the rest of your life, including job prospects and your family. In addition, Michigan has mandatory sentencing laws mean that conviction for many criminal offenses carries mandatory prison sentences such as felony firearm or criminal sexual conduct in 3rd degree. 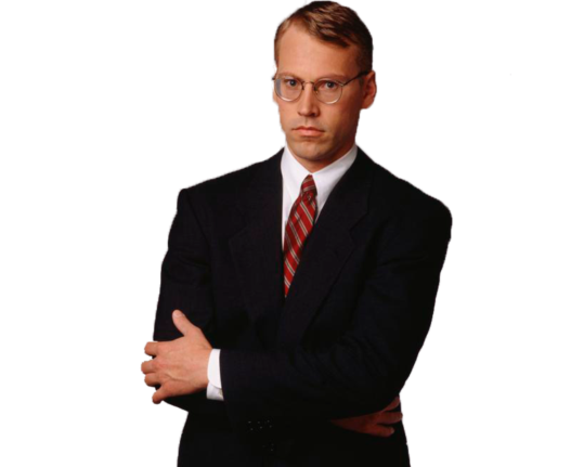 Our best criminal defense lawyers have provided successful representation to hundreds of clients in state and federal criminal defense matters. 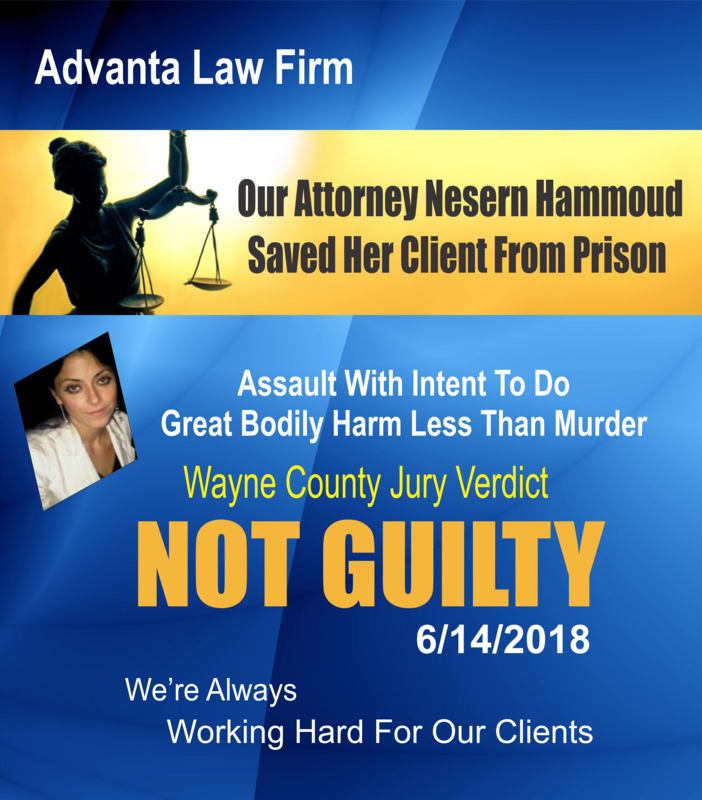 Our goals are the same as those of our clients': to help the accused avoid jail or prison, to get fines, charges, punishments, penalties, and sentences reduced; to suppress evidence which was improperly obtained, to get cases dismissed, and to expunge offenses after a conviction is on record.  We are experienced at working with the District Attorney's office. We challenge the prosecution case to prove every single piece of evidence that is used to support the charges against our clients. Can the prosecutor prove his case? 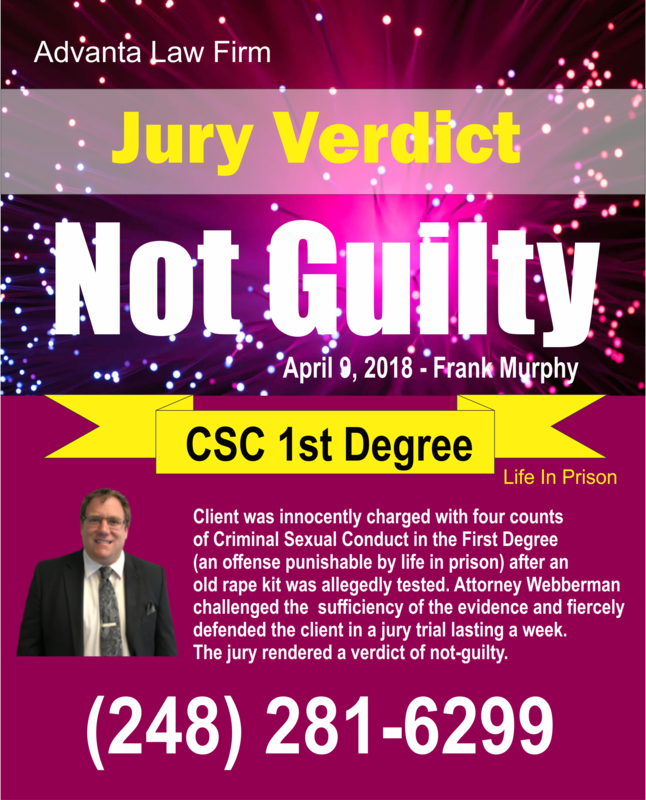 Was improper entrapment a tool of the prosecution? 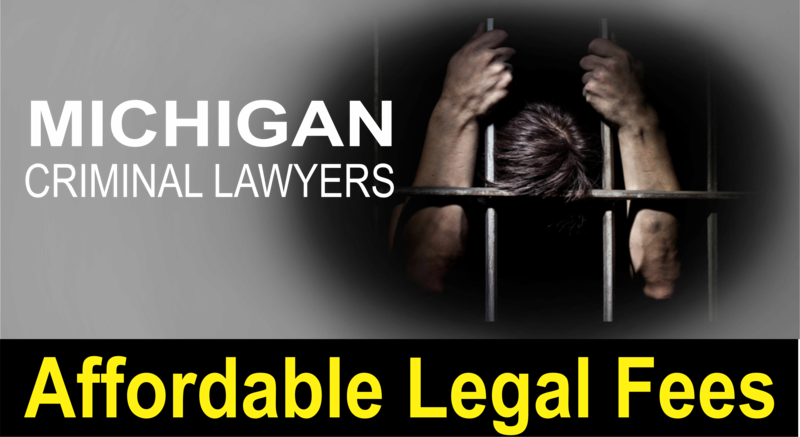 Contact us: If you are under investigation, if you have been arrested in Michigan, if you have been charged, or if you have been convicted, start now to protect your rights, your freedom, and your future. 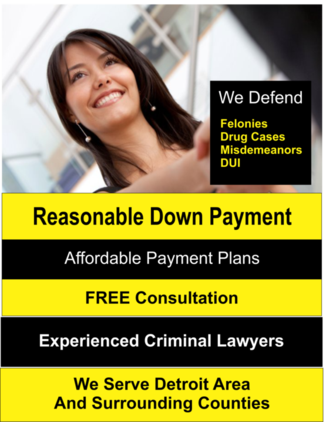 At our Detroit metro, Michigan criminal defense law firm, we answer the phone when you need us most. That means we are available 24 hours a day, seven days a week. Please contact us at 313-982-0010 today. 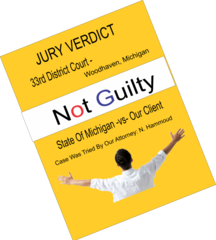 Our office hours are Monday through Friday, 9:00 a.m.- 5:00 p.m.
Our Michigan Criminal Lawyers represent individual in all counties that are within the State of Michigan including Detroit, Ann Arbor, Allen Park, Albion, Lincoln Park, Brighton, Howell, Saline, Monroe, Blissfield, Romulus, Hamtramck, Southfield ,Southgate, Wyandotte, Livonia, Dearborn, Westland, Lansing, East Lansing, Okemos, Warren, Sterling Heights, Roseville, Eastpointe, Battle Creek, Oak Park, Redford, Livonia, Hillsdale, Inkster, Ferndale, Hazel Park, Whitmore Lake, Plymouth, Farmington, Trenton, Flat Rock, Tecumseh, Clinton, Chelsea, Novi, Garden City, Westland, Northville, South Lyon, Milan, Brooklyn, Melvyndale, Ecorse, Belleville, Canton, Wayne County, Ingham County, Washtenaw County, Monroe County, Macomb County, Livingston County, Shiawassee County, Clinton County, Eaton County, Calhoun County, Branch County, Hillsdale. The information contained herein is not legal advice. Any information you submit to us may not be protected by attorney-client privilege. All or some photos shown depict models and may not be actual attorneys or clients. 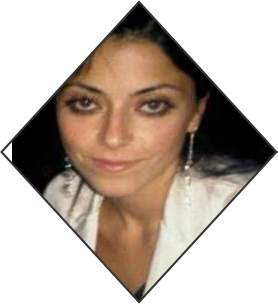 An attorney responsible for the content of this Site is M. Zaher, Esq., licensed in Michigan with offices at 18551 W. Warren Ave., We are expressly disclaim all liability in respect to actions taken or not taken based on any or all the contents of this website. We reserve the right , at our sole discretion, to change, suspend, or discontinue all or any part of this website or the content at any time without prior notice or liability. . * Prior Results Do Not Guarantee Similar Outcome. If you are facing Criminal/Drunk Driving/Traffic Charges it is no laughing matter. You have so much at stake including your freedom, property, driving privileges, and future employment prospects. You only get one chance to hire the right Attorney. 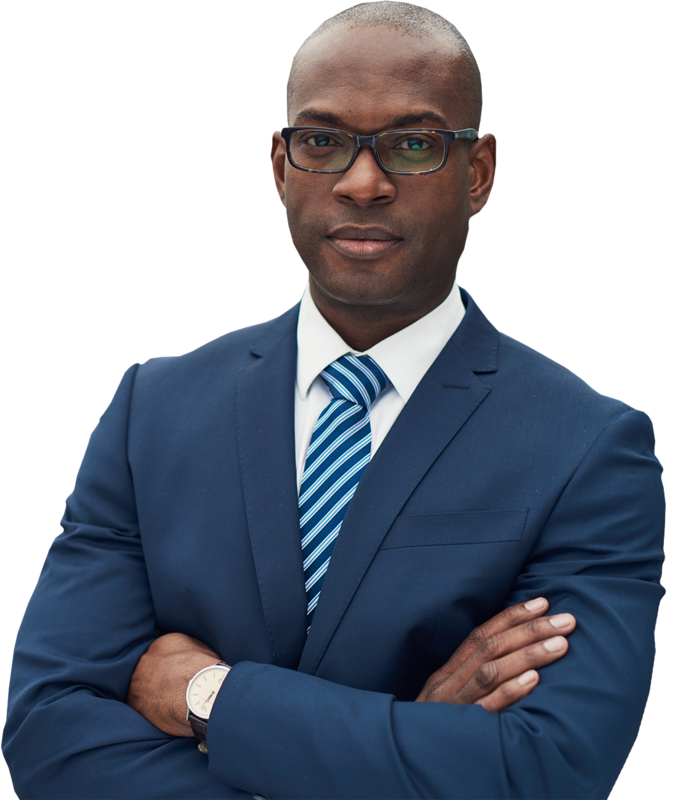 You want an Attorney who has experience, is aggressive, has a proven track record, and will fight to get you the best result possible. 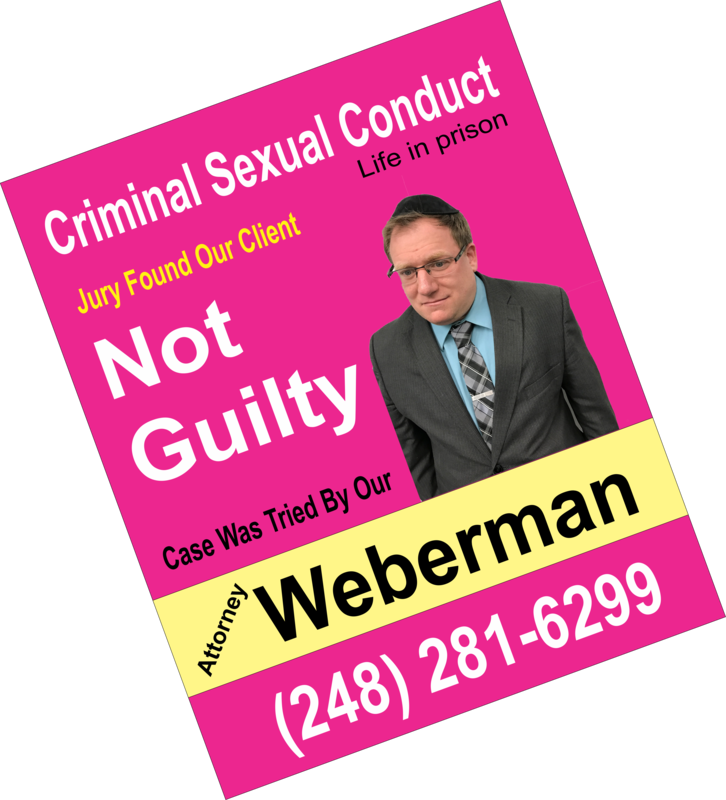 Accused Of A Crime In Detroit Areas? If You Are Accused Of A Crime, The Police Are Not Your Friend, They Have Protocol To Follow. You Do Not Have To Give Them Any Statement. What is your role in this matter? Whether you’ve been charged with a criminal offense, are being investigated by police or federal agents, or are facing other serious legal issues, it’s natural to feel overwhelmed. 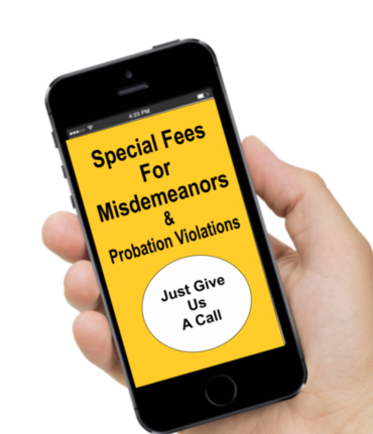 You could be facing incarceration in prison or jail time, harsh probation conditions, hefty fines, loss of employment prospects, or any other restraints on or erosion of your liberties. Any effective criminal defense attorney can inform you of the strengths and weaknesses of your case to outline the risks of possible conviction or punishment. They may offer you information but leave it in your hands whether to plead guilty or contest to take your case to trial.